Our tartan is the Modern Douglas - which was chosen by Mayor Jane Byrne. The green represents Ireland, the blue stands for police from all across Illinois, and the white designates the City of Chicago. The original band uniform consisted of a black Balmoral hat with checkerboard. The shirt worn was the blue Chicago Police shirt along with a navy blue tie with green shamrocks. The kilt is what the band presently wears, the Modern Douglas. The sporran was black leather. The socks worn were white with green flashes. The band marched in this uniform and wore sweaters (purchased from Montgomery Wards) during colder Chicagoland weather during our early years. Change came about when the band members started wearing white spats over the Modern Douglas hose tops, which is significant to the military aspect of the band. This military change facilitated the purchase of horse hair sporrans as well. The shirts worn were changed from Chicago Police blue to white police shirts. Around the same time members switched from wearing their department badges to the band badge. The patches on the shirts are the band patch and the City of Chicago flag. The name tags on the shirts reflect the members name in the native Irish Gaelic. In 1987, the band debuted the traditional full military dress uniform which is still worn today. The band also moved from the Balmoral hats to the current Glenn Garry cap with the black and white checkerboard. The uniform of the Bagpipes and Drums of the Emerald Society, Chicago Police Department is a unique and distinctive blend of traditional Celtic, Military and Police dress. Although the bagpipe itself is an ancient instrument, pipe bands were not common until the middle of the 19th century. It was about this time that the Highland regiments of the British Army began organizing bagpipe and drums into the colorful, structured units that we know today. The influence of the British Army, and especially the Scottish Soldier is apparent in our habits and is in our manner of dress. Many items of pipe band uniforms, which are purely decorative were at one time functional articles of military equipment. Pipers and drummers were expected to perform their duties on the battlefield as well as on the parade ground. Most people have seen Hollywood movies depicting British troops going into battle led by pipers and drummers. Movies concerning these military engagements span the period from the mid 19th century to World War II. Surprisingly the last documented pipe killed in battle was as recent as the Falkland Island conflict in 1982. 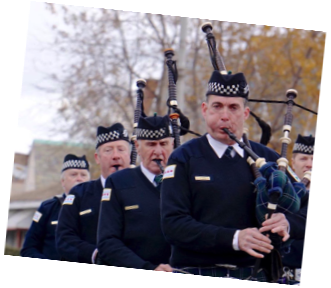 With some significance, the bagpipes used by police bands are knows as the “Scottish War Pipes”. As stated previously, pipe band uniforms evolved from functional articles of military equipment. The white canvas spats protected the feet and ankles while marching. Introduced in the early 1800’s, they would have been dyed grey or khaki for field wears, and then whitened for parades. Beneath the spat are hose tops. These are footless stockings, which are pulled over a regular pair of socks. When the foot of the sock wore out, the more expensive knitted tops could be used again. Garters ornamented with green flashes hold up the hose tops. Garters used to be lengths of colored ribbon tied in a bow. 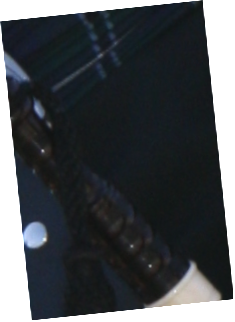 The small knife tucked in the right hose top is a skean dhu (Gaelic for Black Dagger) and could be used as a weapon or more practically as a tool or pocket knife. The kilt is a garment that was worn by warlike men of the rugged Scottish Highlands. The kilt evolved from a type of large blanket or cloak, which the clansman would draw around their body, belting it at the waist to form a skirt, then wrapping the remainder around their chest and fastening the tail over the shoulder with a brooch. During the early 18th century the upper and lower portions were separated forming the modern kilt and shoulder plaid (pronounced played). The pattern or tartan of the kilt identifies the wearer’s regiment, family or region or origin. In an unsuccessful attempt to crush Scottish nationalism, the English outlawed the wearing of the kilt from 1746 through 1781. For over two hundred years, in peace and war, Celtic soldiers all over the world have proudly worn the kilt. Members of the Bagpipes & Drums of the Emerald Society, Chicago Police Department wear the Modern Douglas tartan. Former Mayor Jane Byrne of the City of Chicago chose this tartan with green representing our Irish heritage, blue for police and white for the City of Chicago. The white horsehair sporran was originally a plain leather purse. There are no pockets in a kilt. In the Army, the sporran was decorated with fir, goat and horsehair and became more ornamental than practical. The color and number of tassels can recognize regiments and bands on their hair sporran. When the Band performs in the formal dinner jacket, the less colorful leather sporran is warn. The wide leather cross belt, which is work to secure the plaid, and waistband belt with its large buckle at one time afforded some protection from sword thrusts. The belt could carry a pistol or a long knife (dirk) as seen displayed by some drum majors. The band wears a classic military tunic patterned after the British soldier’s dress blues. In warmer weather band members wear the white shirt of the Chicago Police Department, as recognized by the flag of the City of Chicago on the right shoulder. On the left shoulder is worn the patch of the Bagpipes and Drums of the Emerald Society, Chicago Police. Following the uniform tradition of the Department, each member displays a name tag on their shirt, but if you look closely the family surnames are in Gaelic. The police star worn above the heart is patterned after the Chicago Police star and is duplicated as a brooch to secure the plaid when the tunic is worn. Senior non-commissioned officers in military pipe bands (pipe/drum major, pipe/drum sergeants and pipe/drum corporals) wore silver or gold ranked stripes. These were bright and very large in size so that troops could easily spot their leader in the haze and confusion of battle. The headgear of many pipe bands comes in three variations. Legend has it that the original military pipers wore the Glengarry to signify that they were soldiers, while the drummers work the Scots Balmoral bonnet because they were hired civilians. Although the band was originally outfitted in the tam-like Balmoral, all members now wear the Glengarry. You will notice that the black and white police dicing decorates the Glengarry. A variation of this color combination is red and white and is still worn by bands in Scotland and Canada. People of Chicago will remember that O.W. Wilson adopted this distinctive design in the 1960's for the Chicago Police Department Uniform Hat. When the band is dressed in full miltary regalia, the feather bonnet is worn. This headgear is often mistakenly called a Busby. Originally a simple Balmoral, over the years is decorated with fur and ostrich feathers. The large plumes work on the side are known as hackles. Once again the blue hackles signify the police affilication and are worn by the non-commissioned officers. The rest of the Band members wear the green hackle in honor of the Emerald Isle. The pin, which is displayed on the Glengarry is the Garda Pin. A silver badge that at one time was the Irish Police Badge. It reads in Gaelic “Siochana Garda” which translates to Civic Guard. The badges are no longer available since the Irish Police have changed to a gold pin. The band uniform is always cost prohibitive, however we regard the investment as worthwhile. It is not only the sound, but also the sight of a military band which stirs the heart of a spectator. The traditions, which such our band perpetuates are certainly grand and truly “honor our fallen".